“These organizations have a very strong track record in terms of attracting youth and getting really good positions with them, and working with the business communities,” said Civic Progress Chair Suzanne Sitherwood. A majority of the funding will focus on north St. Louis within the borders of Vandeventer Avenue, Dr. Martin Luther King Jr. Drive, Goodfellow Boulevard and West Florissant Avenue. The grants presented by the Regional Business Council and Civic Progress are part of a collaborative effort with the Department of Public Safety and the St. Louis Metropolitan Police Department. The goal of the partnership is to reduce the amount of violent crime in the city. More than 400 people have already graduated from the Save Our Sons program which helps train young men and place them on jobs. Will Donlow, now a spokesman for Save Our Sons, graduated from the program himself. 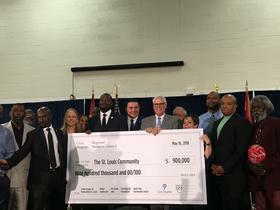 The funding will also be used to increase educational opportunities for at risk youth, including money to assist with elementary schools in north St. Louis.